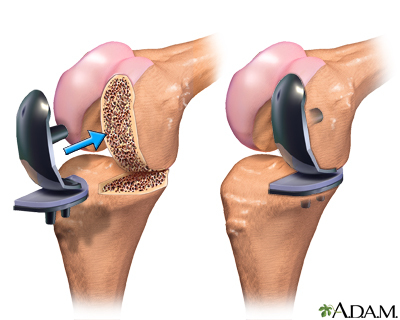 A partial knee replacement is surgery to replace only one part of a damaged knee. 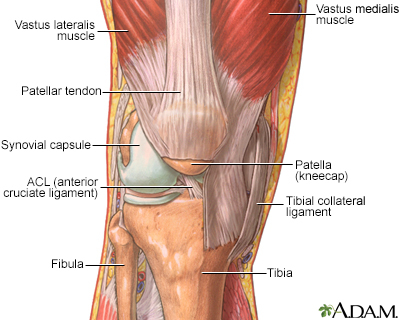 It can replace either the inside (medial) part, the outside (lateral) part, or the kneecap part of the knee. 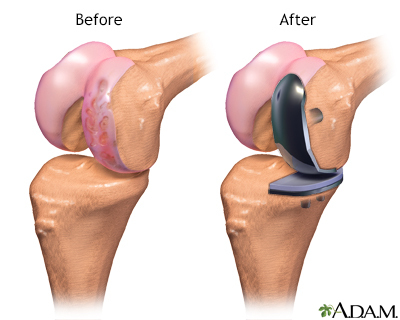 Partial knee replacement surgery removes damaged tissue and bone in the knee joint. It is done when arthritis is present in only part of the knee. The areas are replaced with a man-made implant, called a prosthetic. The rest of your knee is preserved. 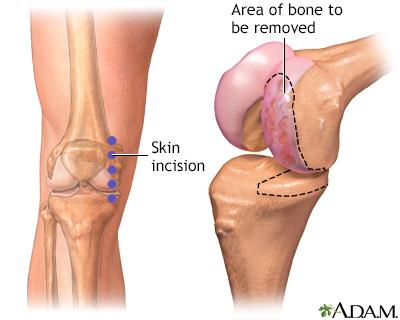 Partial knee replacements are most often done with smaller incisions, so there is less recovery time. The surgeon will make a cut over your knee. This cut is about 3 to 5 inches (7.5 to 13 centimeters) long. Next, the surgeon looks at the entire knee joint. If there is damage to more than one part of your knee, you may need a total knee replacement. Most of the time this is not needed, because tests done before the procedure would have shown this damage. 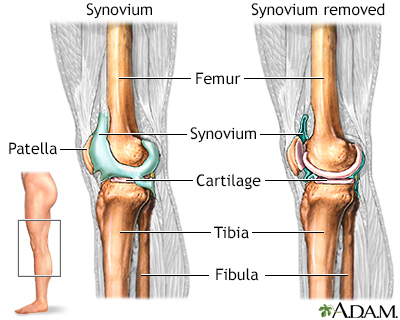 The most common reason to have a knee joint replaced is to ease severe arthritis pain. You can't sleep through the night because of knee pain. Your knee pain prevents you from doing daily activities. Your knee pain has not gotten better with other treatments. You will need to understand what surgery and recovery will be like. You are older, thin, and not very active. You do not have very bad arthritis on the other side of the knee or under the kneecap. You have only minor deformity in the knee. You have good range of motion in your knee. The ligaments in your knee are stable. 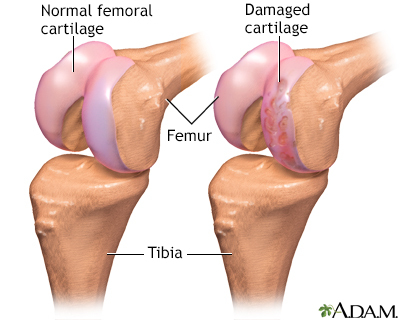 However, most people with knee arthritis have a surgery called a total knee arthroplasty (TKA). Knee replacement is most often done in people age 60 and older. Not all people can have a partial knee replacement. You may not be a good candidate if your condition is too severe. Also, your medical and physical condition may not allow you to have the procedure. Always tell your provider which drugs you are taking, including herbs, supplements, and medicines bought without a prescription. Ask your provider which medicines you can still take on the day of your surgery. You may be asked to stop taking medicine that makes it harder for your blood to clot. These include aspirin, ibuprofen (Advil, Motrin), naproxen (Naprosyn, Aleve), blood thinners such as warfarin (Coumadin), and other drugs. You may need to stop taking any medicines that weaken your immune system, including Enbrel and methotrexate. Tell your provider if you have been drinking a lot of alcohol (more than one or two drinks a day). If you smoke, you need to stop. Ask your providers for help. Smoking slows healing and recovery. Let your provider know if you get a cold, flu, fever, herpes breakout, or other illness before your surgery. You may want to visit a physical therapist before surgery to learn exercises that can help you recover. Practice using a cane, walker, crutches, or a wheelchair. You may be told not to drink or eat anything for 6 to 12 hours before the procedure. Take the medicines your provider told you to take with a sip of water. You may need to stay in the hospital for 1 to 2 days. Most people are able to go home the day after surgery. Most people recover quickly and have much less pain than they did before surgery. People who have a partial knee replacement recover faster than those who have a total knee replacement. Many people are able to walk without a cane or walker within 3 to 4 weeks after surgery. You will need physical therapy for 4 to 6 months. Most forms of exercise are OK after surgery, including walking, swimming, tennis, golf, and biking. However, you should avoid high-impact activities such as jogging. Partial knee replacement can have good results for some people. 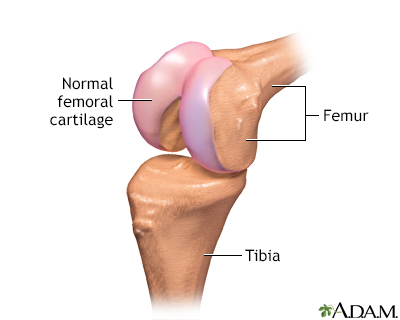 However, the unreplaced part of the knee can still degenerate and you may need a full knee replacement down the road. Partial inside or outside replacement has good outcomes for up to 10 years after surgery. Partial patella or patellofemoral replacement does not have as good long-term results as the partial inside or outside replacements. You should discuss with your provider whether you are a candidate for partial knee replacement and what the success rate is for your condition. Weber KL, Jevsevar DS, McGrory BJ. AAOS clinical practice guideline: surgical management of osteoarthritis of the knee: evidence-based guideline. J Am Acad Orthop Surg. 2016;24(8):e94-e96. PMID: 27355287 www.ncbi.nlm.nih.gov/pubmed/27355287.